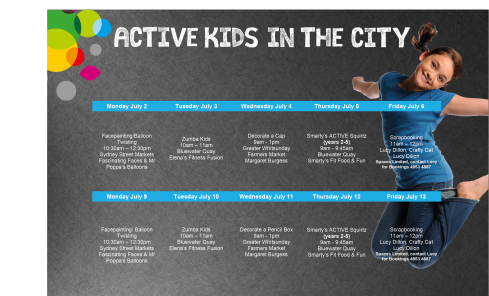 Active Kids in the City offers a plethora of activities for children big and small – arts and crafts, get out get active and more – and all of it is completely free! Each school holidays, a free activity is run every day. Get out of the house and keep the kids busy with our free school holiday program. Check out the What’s on Calendar for individual event details.